Metrovac's Vac N' Blo is an excellent product. In fact I got this new one not because my old one stopped working but because it was beat up from years of use! They last a long time! The reason for 4 stars instead of 5 is for the following reasons only; 1.) I think Metrovacs are priced too high but thanks to Ovestock.com I saved $60! And 2.) On my old Vac N' Blo the tip of the hose cames off over time. I've had to buy 2 new ones over the course of several years. While this may seem normal, I think the hoses should be better made and be less expensive as replacement parts. Otherwise I highly recommend Metrovac and Overstock.com to save money! Vacuuming your car is a breeze with Vac N Blo Automotive. On road or off, Vac N Blo offers the versatility you need. This twin fan 4 peak horsepower vacuum is the most powerful car vacuum ever tested. It has an amazing 95 inches of water lift (the standard measure for a vacuums efficiency). Compact, powerful, portable, it's heavy-duty, lightweight, all-steel body is only 17 long and 7 in diameter which makes it easy to handle. Use it off road, too, as a vacuum for cleaning around the house or yard, or as a blower to inflate rafts, air mattresses or blow away leaves. The Vac N Blo comes fully equipped with a wide range of attachments, so whether the job calls for power or precision, you'll have the right tool at hand. A 6 foot flexible hose plus two 20 inch extensions reach even the furthest corners. Other attachments include: an Upholstery Tool, Dust Brush, Crevice Tool, Blower Nozzle, Air Mattress Inflator, Shoulder Strap plus four Detailing Attachments to get into tiny spaces. It's great for cars, trucks, SUVs or to clean your garage. The Van N Blo features a 4.0 peak HP Motor. The convenient wall mount provides you with a central vacuum cleaner for your garage, and 24 feet of hose gives you access to every nook and cranny in your car without ever moving the vacuum cleaner. 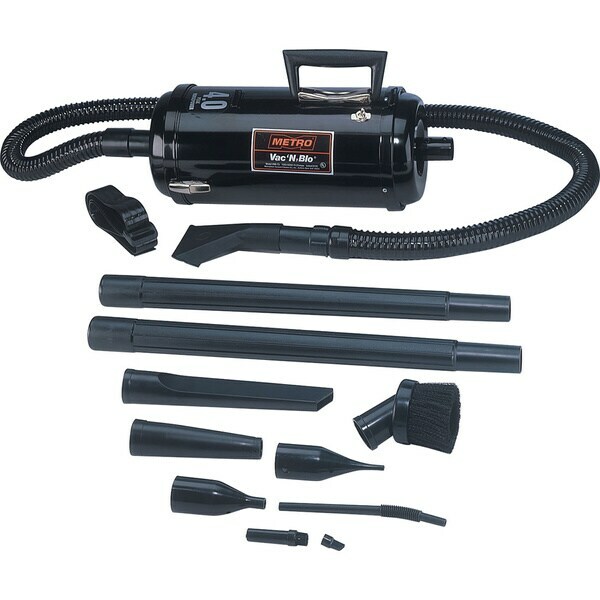 Included parts: Vac 'N' Blo; six-foot hose; carpet/floor tool, two 20-inch extension wands; Pik-All nozzle; crevice tool; dusting brush; blower nozzle; inflator adapter; four-piece micro cleaning tool kit; shoulder strap; and reusable filter bag. This vacuum is exactly what i was looking for, compact, powerful and lots of attachments to clean my car. Comes with a nice carry strap too! It appears to be very well made, all tools seem very sturdy and are easy to attach and do not come loose. Best part of this vacuum : It's MADE IN THE USA!! great company history.. tbh, made me very proud to have purchased this brand. If in doubt don't hesitate, much better than other smaller hand held vacuums ! Powerful machine, works great inside the car and blows the water off outside the car. Very nice vacuum. The reason for the lack of 5 stars is because it is difficult to hold while cleaning your car. It doesn’t have a base to set it down on and I don’t like the metal canister getting scratched setting it down on my garage floor. Also the canister gets REALLY hot when using. Was tired of buying car vacs. That did not work well. Finally bought this product and it is worth every dollar. The price is a steal .